If you look all over the world for someone more worthy of your love than yourself, you will not find another. 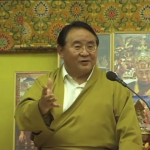 In this recent teaching from Barcelona, Sogyal Rinpoche explains that when we practise compassion, we begin by getting in touch with ourselves through meditation, arriving at the soft spot of our good heart. It is when we come into touch our capacity for kindness and compassion, and come to love ourselves, that we engage in the practice of loving kindness by extending this love to others. You can find more on compassion and instructions on how to practice loving kindness on page 199 of Chapter 12, ‘Compassion: The Wish-fulfilling Jewel’, in The Tibetan Book of Living and Dying.